A Maine-based company appears to have found a formula to win local backing for often controversial solar-energy projects: careful siting, a dose of patience and a willingness to alter plans to overcome objections. Ranger Solar's ability to earn selectboard approval is particularly noteworthy given the size of its projects. While proposals for much smaller solar installations have encountered fierce local resistance around Vermont, Ranger Solar has won outright support in three towns for arrays that average 100 acres apiece. If completed, each of the company's five proposed 20-megawatt installations would be six times bigger than the largest array operating in Vermont — a 15-acre, 3.6-megawatt solar field on an Essex Junction farm. The 95,000 solar panels needed for each $29 million Ranger project would cover an area up to the size of 75 football fields and could power 5,000 homes. The projects' size has not deterred Ludlow, Sheldon or Brandon, where selectboards have signed letters of support for Ranger Solar's proposals in their towns. The company is negotiating with Randolph and Highgate for similar-size projects. Still, Ranger's success is far from assured. Local backing does not guarantee that any of the solar fields will ultimately be built. Gov. Peter Shumlin said last fall that the projects are too big for Vermont, and the state's utilities — which would presumably buy the power — have at times vocally opposed the arrays. Ranger Solar must receive approval for each development from the Public Service Board, which will consider many factors to determine whether the projects serve the public good. So far, Ranger has sought PSB approval only for the Ludlow solar field. The board has indicated it will make a decision by year's end. That it has earned local backing will definitely help Ranger's case. The company's progress contrasts with much smaller solar development proposals that have been halted or delayed by a barrage of public opposition. Last year, Rutland Town residents went to the Vermont Supreme Court to try to block a proposed 2.3-megawatt solar array. (The court ruled in April in favor of the developer.) Rutland Town's experience led more than 50 towns to sign a petition requesting greater say in the siting of renewable energy projects. New Haven, Charlotte and Bennington have all seen vocal protests against small solar projects, and intense local opposition in Windsor last winter prompted GroSolar and Green Mountain Power to abandon their plan for a 35-acre array. Ranger heard these stories and planned accordingly, said company president Adam Cohen. The solar developer is engaging in grassroots work to defuse conflicts before they start. A case in point: In an interview, Brandon Selectboard vice chair Seth Hopkins recalled that residents expressed concern about the lack of wildlife corridors through the proposed solar field. In response, Ranger Solar purchased additional land so that animals would have room to pass between the panels. "That was goodwill on their part," Hopkins said. "They go the extra mile." Ranger Solar representative Aaron Svedlow jumped in when a Randolph resident complained at a meeting in June about the project's effect on his view. Only tall trees could screen the eyesore, he said. "Trees? What kind of trees do you want?" Svedlow asked. "Maple — 14 feet tall," the man shot back. Svedlow agreed to pay for the landscaping, and the objector fell silent. The Department of Public Service, utilities and other stakeholders are keeping a close eye on Ranger's plans. Officials say the projects may set precedents for the permitting, siting and energy sales of future solar installations. If all five Ranger projects were to be built, the additional 100 megawatts of energy would increase the state's total solar output by about 70 percent, according to Jon Copans, deputy commissioner of DPS. "These filings are significant just by virtue of the scale of the projects," said Copans. "Any project that is approved has the potential to become a model for a future project. It demonstrates there's a pathway to approval." The projects are ambitious for a year-and-a-half-old company with six employees and no completed solar development. 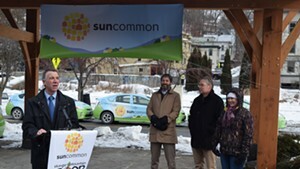 While Ranger Solar is also working to establish arrays in New Hampshire, Connecticut and Maine, the Ludlow project — at 90 acres, the smallest of the five proposals — is furthest along, Cohen said. He said he doesn't know when the company will file PSB applications for the other developments. Before Ranger, Cohen founded and spent six years running Pioneer Green Energy, a Texas company that installs major renewable-energy projects across the U.S. By the time Cohen left to establish Ranger Solar, he had overseen the creation of 700 megawatts of wind and solar projects in six states, he said. He was drawn to New England, he said, by the burgeoning market for solar. When it comes to siting solar development, Ranger has its own set of criteria: town officials open to the possibility; a landowner willing to lease land; minimal environmental impacts; and proximity to a substation to connect to the electric grid. In each of Ranger Solar's target towns, the company spent months finding locations off the beaten path and returned again and again to selectboards with amended project plans. In Brandon, Ranger Solar's choice of a site — relatively isolated, invisible from Route 7, on a dirt road that's not maintained during winter — was key to winning support. "If they had come in and said, 'We want to put a 20-megawatt array along Route 7 when you come into town,' I think it would have been a whole different discussion," said Hopkins, the selectboard vice chair. "To be honest with you, we got very little negative feedback," said Brandon town manager David Atherton of the public response. Ranger Solar was "really reasonable to work with," he added. In Ludlow, the first town to offer support, the solar array would be located on hayfields and pastureland away from the town center. "It's on a dirt road — this project is significantly out in the middle of nowhere," said Frank Heald, the municipal manager. "[Ranger Solar] worked diligently, I believe, with the surrounding landowners reaching, negotiating agreement." The selectboard voted unanimously to endorse the proposal in December. Sheldon's board also voted unanimously for its array and was "very supportive" of the proposal, according to Cohen. Ranger Solar has encountered more skepticism — and outright opposition — in Randolph, where the selectboard has not yet voted on the proposed project. There, questions of scale and aesthetics arose immediately. Former Randolph Selectboard chair Larry Richburg expressed doubts early on, the Herald of Randolph reported. "A 100-acre solar farm seems a little out of scale for Vermont," Richburg said at a September meeting with the developer, according to the Herald's report. "My biggest concern is, will it be hidden away enough so it won't be an eyesore?" At a June public hearing, some residents called the 100-acre proposal "far-fetched," and one resident deemed the installation "way too extreme" for a town of Randolph's size. 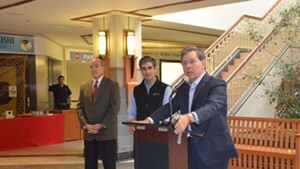 Cohen said Ranger Solar plans to return to Randolph with an amended site plan in the coming months. Ranger has offered each of the five towns a financial package — about $175,000 upon construction of the array, with annual $35,000 payments in the first five years of solar operation and $25,000 in following years — though the specifics of the deals vary by town. According to Ludlow's Heald, the financial incentives didn't determine the selectboard's decision, but they didn't hurt, either. "It's money that the town might not otherwise have that might just sweeten the pot," he said. Starting this fall, towns can be assured a stronger voice in the siting of renewable-energy projects. A bill passed in June by the legislature grants towns "substantial deference" in determining the siting of renewable-energy projects — stronger language than the "due consideration" required under current law. Ranger Solar says it's already compliant with the new rules. "We already to do all the stuff in the bill," Cohen said. "More, actually." Another problem? Until recently, the Vermont utilities that would buy Ranger's power have vehemently opposed the arrays, because the company was seeking permission from the Public Service Board to charge federally allowed rates the local utilities consider to be too high. Now Ranger has indicated it will seek its own deals to sell the energy directly to one or several Vermont power companies. Cohen declined to say whether those talks were under way. Without more information, power companies aren't sure where they stand on Ranger's Ludlow project. "We'll have to see what their plans are," said Neale Lunderville, general manager for the Burlington Electric Department. "Where they're going to sell, who they're going to sell it to." At the same time, the state's renewable-energy goals are looming. By 2017, Vermont electric utilities must buy 55 percent of their energy from renewable sources. The state aims to reach 90 percent renewable energy by 2050. But even if Ranger Solar secures an agreement with utilities to buy its energy, there's a chance it won't contribute toward Vermont's energy goals. Renewable-energy credits associated with a project must be sold in Vermont to count toward those goals. Cohen has indicated that the company intends to sell both the energy and the credits from the arrays in Vermont, though typically, energy companies can get better prices for credits outside of the state. 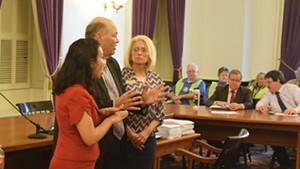 It's important that the state reap the benefits from Ranger Solar and similar projects, said retiring Rep. Tony Klein (D-East Montpelier), chair of the House Natural Resources and Energy Committee. 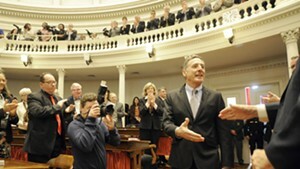 Vermont imports 86 percent of its energy, he noted, and ranks last among states in energy production. According to DPS' Copans, the debate around the future of solar energy and proposals like Ranger's in Vermont comes down to a philosophical question: "Do we prefer to have 40 500-kilowatt projects or one 20-megawatt project?" Such questions won't be going away anytime soon — and neither will Ranger Solar. According to Highgate Selectboard minutes from September, the company broached the possibility of a 200-megawatt, 1,000-acre installation. "It could be a long, long-term horizon, but it's not something we're working on anytime soon," Cohen assured Seven Days. 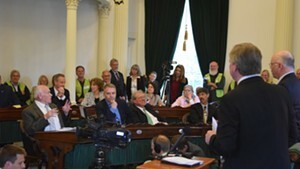 Then he mentioned the state's aggressive goals for renewable energy. "There's going to need to be a lot of clean energy in Vermont," he said. "You're not going to get there by smaller projects."